Description: US #205 on cover postmarked SAN FRANCISCO, CAL., JUL 23, 10 AM., '85 sent to Honolulu, Oahu with HONOLULU, H(awaiian).I(slands). backstamp. Description: Stampless folded letter postmarked red APALACHICOLA, F(lorida).T(erritory)., NOV 15 with matching fancy X cancel sent to Providence, RI. Description: CSA #11 on manuscript TREASURY DEPARTMENT CSA, 2ND AUDITOR'S OFFICE cover postmarked RICHMOND, VA., OCT 20 sent to Alamance, North Carolina. Description: US #11 singles on folded triple rate insurance letter postmarked BANGOR, ME., 3 PAID, FEB 23 sent to Belfast, Maine. Description: Stampless cover postmarked NASHVILLE, Te., OCT 21 and matching fancy 10 sent to Raines Tavern, Virginia. Description: Stampless folded letter postmarked CHICAGO ILL. JUN 25 with fancy 10 in circle sent to Portland, Maine. Description: Stampless cover handstamped STEAMSHIP 10 in circle sent to Bucksport, Maine. Handstamped advertising from Havana, Cuba on verso. Description: Stampless folded letter sent from "New York" with a red STEAM BOAT straight line handstamp sent to Providence, RI. Description: Stampless folded letter sent from "New York" with red STEAM BOAT straight line handstamp sent to Providence, RI. Description: US #24 on folded printed circular postmarked BALTO.PAID. double cirlce sent to Short Creek, Ohio. Description: US #24 on folded printed circular postmarked SAVANNAH*GEO* JUN 4 sent to Providence, RI. Description: CSA #12 on cover postmarked STAUNTON, Va., sent to Fayetteville, NC. Description: CSA #12 on cover postmarked violet LYNCHBURG, Va., AUG 31 sent to Opelika, Alabama. Description: CSA #7 pari on cover postmarked GRENADA, MI., AUG 13 sent to Carrollton, Mississippi. Description: CSA #11 on cover postmarked BATH C.H., Va., SEP 25 sent to Lexington, Va. Description: CSA #12 on cover postmarked CHARLESTON, S.C., JUN 10 sent to Pickensville, SC. Description: CSA #6 on cover postmarked MARION, VA., sent to New Plymouth, Va. Description: CSA #12 on cover postmarked MOBILE, ALA. sent to Aberdeen, Mississippi. Description: CSA #11 on cover postmarked MOBILE, ALA., JUL 2 sent to Columbus, Mississippi. Description: CSA #11 on cover postmarked JACKSON, MISS., JAN 20 sent to Pleasant Valley, Alabama. Description: CSA #11 on cover postmarked RICHMOND, JAN 22 sent to Draughon's Store, NC. 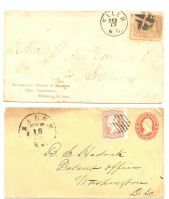 Description: CSA stampless cover postmarked Bainbridge, Ga with PAID 5 rerated to 10 handstamp and manuscipt "Paid 10" sent to Port Royal, Va. Description: CSA #11 on cover postmarked BATH C.H., Va., AUG 10 sent to Lexington, Va. "Double Quick" manuscript note at lower left. Description: CSA #11 on cover postmarked brown BROWNSBURG, VA., DEC sent to Timber Ridge, VA. Description: CSA #6 pair on cover postmarked WINCHESTER, VA, OCT 15 sent to Mocksville, NC. Description: CSA #12 on cover postmarked blue PETERSBURG, JUL 11 sent to Montrose, NC. Description: Stampless embossed ladies cover postmarked OBERLIN, O., JUN 4 with fancy star burst 5 in circle sent to Cherry Valley, Ohio. Description: Stampless cover postmarked SAVANNAH*GEO* APR 6 with matching 10 in doucle circle sent to Savage, Maryland carried on the Steamer Saranac.